First, I cut the peppers in half and shucked (sp?) the corn and put it all on the grill to roast (outside). You could also do this in your oven with the broiler on before you cook the potatoes. Make sure you keep checking on them and turning them so that they get blackened on all sides. Next, I cut the potatoes in wedges and placed them on a cookie sheet lined with parchment paper. I sprinkled a little bit of Spike on them and some garlic powder. Put those in the oven and bake at 425 degrees (or so…our oven is old, so I’m not exactly sure of the temp.). While the potatoes and veggies are cooking (keep checking the veggies! ), I chop the onion and put it in a stock pot with a little bit of water to saute until translucent. Once translucent, I add the garlic and cook for about 30 seconds to a minute more. Then, the veggies should be about done on the grill, so go get those and chop up the peppers and cut the corn off the cob and add to the chili. Add the rest of the ingredients and simmer to blend the flavors of the spices. Once the potatoes are done, put them in a bowl or on a plate (depends on how thick your chili is…mine was thick enough for a plate, but my plate’s edges were turned up). 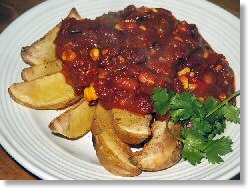 Ladle the chili over the potatoes and feed your hungry family! I usually make something like this for my family and ladle the chili over a big green salad for myself. My kids have salad, too, but they like the chili on the fries and their salad on the side. You could also roast a yellow squash or a zucchini to add to the chili as well.